Total Hardness is often referred to as Calcium Hardness or Total Hardness. Total Hardness is a measure of the amount of dissolved calcium and magnesium in the hot tub water. The basic recommended range in a hot tub is between 200 and 400 parts per million. This can vary depending on the hot tub finish and chemicals you are using to treat your spa. For example; an acrylic spa using Bromine is recommended to have a total hardness level of between 175 and 225 ppm. For Pristine Blue the recommended total hardness level is between 100 to 300 ppm. Another factor in determining hardness levels is water temperature, (the colder the water, the more calcium is needed). Higher levels of total alkalinity or pH will require lower calcium levels of hardness to prevent scaling. Remember, the recommendations are ideal and a wider range of values can be acceptable. What is the problem if your total hardness is too high or too low? If your spas hardness level is low, you can experience plaster etching, equipment, jet and plumbing corrosion. To correct this problem add SpaPure Hardness Increaser or ProTeam Calcium Up. If your total hardness is too high, the hot tub water may not be able to hold all the minerals, and calcium can fall out of solution, causing scale buildup and cloudy water. How can you lower your Hardness Level? 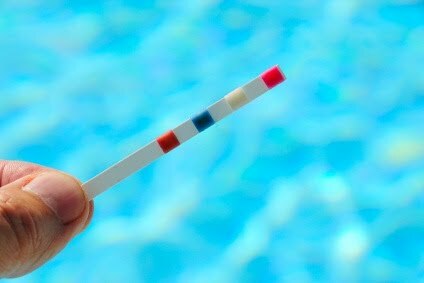 Pristine Check can help remove calcium from hot tub water. If your fill water has high calcium you can use a Pre-Fill Filter to help remove these minerals. There are also products like SpaPure Stain and Scale Preventer and ProTeam Metal Magic. These products will not lower the calcium hardness, but they will prevent scale buildup. Simply add a small dose each week to protect your spa from calcium buildup that can damage jets, heaters, and other equipment components. It is recommended to test for Total Hardness approximately once a month. A few test strips and kits that will test for Total Hardness include: AquaChek Bromine Test Strips, AquaChek Select Test Strips, Taylor K-2005, Taylor K-2006, Taylor K-2106 and Lamotte ColorQ 2056, 2057, 2062 and 2066. Testing for hardness levels using these products is a snap and will protect your hot tub and prevent unnecessary expenses for repairs of your hot tub.